Hover over the red circles in the screenshot below to explore different options. Hemoglobin entry 4hhb is used in this example. Select from four modes of predefined style and color settings for Jmol. The default mode colors residues by 'Secondary Structure'. The 'Subunit' mode renders all protein subunits in different colors, and the 'Symmetry' mode emphasizes the point group symmetry or helical symmetry of a protein complex. The custom view can be used to access additional options for style, color, surface rendering, and more. 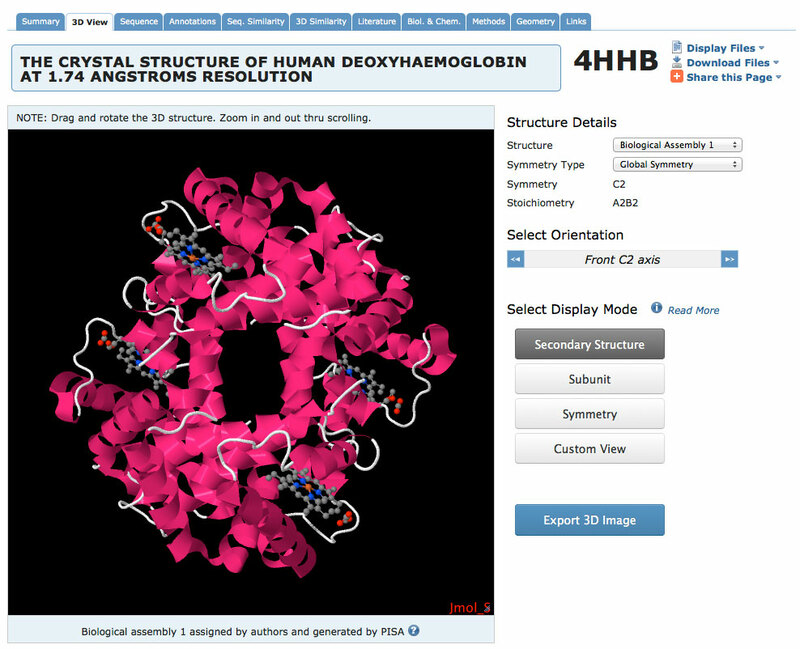 Renders structure in Cartoon style and colors protein subunits in different colors. This mode is useful for visualizing quaternary structure. Renders structure in CPK style and colors subunits to emphasize symmetry of a protein complex (read more about color schemes). The structure is enclosed by a polyhedron and symmetry axes are drawn to elucidate the symmetry of a complex. For asymmetric structure, a rectangular box and the three axes of inertia are drawn. Provides full access to all styles and color schemes, options for surface and hydrogen bond display, change of background color, and toggling on/off autorotation. * Works both when clicking on the molecule or away from it. * Only works if double-click is done away from the molecule.